With a 9 year old, 7 year old, and 22 month old at home, our lives are needless to say, quite full. While we try to be intentional with not over-scheduling, for both their sanity and ours, we still find ourselves on the go to one activity or another 4-5 days of the week, and of course there's school. While I cook 18-20 of our main meals at home each week, and pack the kid's school lunches everyday, there are still the in-between snacks to be accounted for. Kids get hungry, and personally speaking, I don't know if I can manage to spend one more second in the kitchen making homemade fruit leathers, without losing my mind. So while we strive to feed the kids "whole foods" the majority of the time, this momma needs some good prepackaged snacks to fall back on. 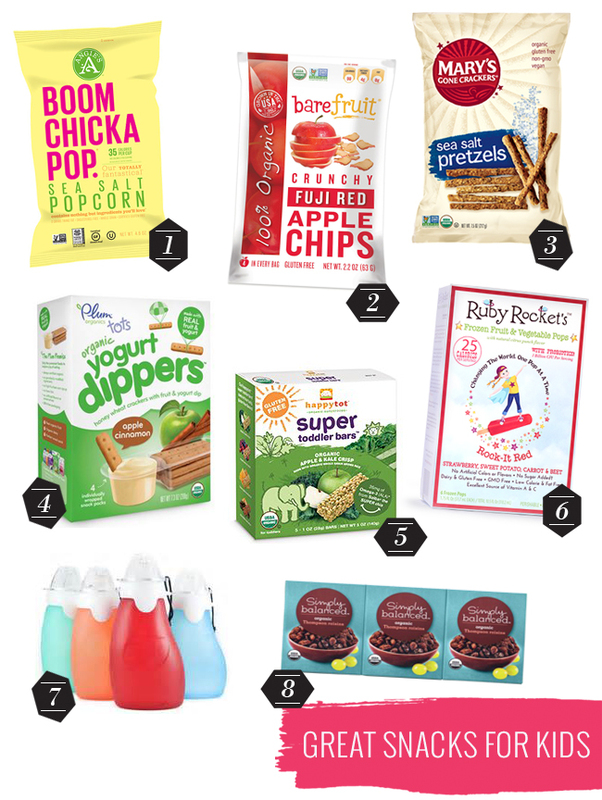 The search for healthy packaged snacks is always ongoing, as new products hit the grocery store shelves and I continue to inspect labels, but I thought I'd share a few of my favorites that I've found so far. Because we have such a vast age spread between the youngest and oldest, I try to find snacks that can work all around, but the baby isn't going to always be able to eat what the big kids are eating, at least for now, so I've included some baby/toddler snack options, as well as a few the whole family loves. And it goes without saying that while at home, I try to always nudge in the direction of unpackaged snack foods like yogurt, cheese & apple slices, peanut butter & banana, etc., but we're human after all, and some days we just want something crunchy and yummy to nosh on. Right? 1. Angie's Popcorn is a favorite in our house because of the limited ingredient list (popcorn, oil and salt), and it fills that crunchy, salty snack craving. It's carried at a wide number of stores and I'll often find it on sale, so I'll pick up a couple of bags at the discounted price. We also love SkinnyPop, and I've seen both brands at Costco at one time or another. Both brands are non-gmo certified, and Trader Joe's also have an organic olive oil popcorn that is non-gmo. 2. BareFruit apple chips are ridiculously amazing. They're a bit expensive too, so I ration these, only packing a small amount in the snack size baggies for school lunches, and hiding them way up high in the pantry so the kids can't pilfer them. We all love these, but they are a bit crispy, so I only give them to my 22 month old when I am right close to him and can break off small pieces for him. I wouldn't recommend these for really young guys. 3. Mary's Gone Crackers Sea Salt Pretzels are organic, gluten free, non-gmo and vegan, and packed with yummy nutritive ingredients. The older kids find them a bit too salty, so these are mainly for me and the baby to enjoy. They're also much more affordable than Glutino gluten free pretzels. 4. Plum Tots Yogurt Dippers have a few more ingredients than I'd like, but the're decent ingredients and I'm okay with giving these to the baby every once in a while. He really loves them and claps when he sees me bring them out. Can be a bit messy if your guy isn't a proficient feeder, so beware, but still a fun snack for the kiddos if you're open to the occasional mess. 5. Happy Tot Super Toddler Bars come in a few flavors and are made with some nutrient dense ingredients like kale and berries. Again, this snack has more than 5 ingredients, my usual rule of thumb when buying packaged foods, but I can recognize all of them and good for an occasional snack. 6. Ruby Rocket's Popsicles are so awesome because they are made with 100% pure fruit and vegetables and no artificial, added sugar anything. The kids love them, and you can either play up the veggie thing or not, because the kids won't notice they're made with kale, sweet potatoes or beets. Did I mention they are also packed with probiotics, which promote gut health? Truly an awesome snack! 7. Sili Squeeze pouches are great if your kids love those fruit squeeze pouches with applesauce or yogurt in them, but you don't love the price. Save money and make sure you know what your kiddos are eating with these reusable, washable silicone pouches, made by a mom for moms. 8. Organic raisin packs are an easy and yummy sweet snack that is a great real food option on the go. You can also buy little packs of nuts, or just toss some in a snack pouch, combine with raisins and you have instant trail mix. So what are some of your favorite snack options for the kids, which are both healthy and convenient? I'd love to hear some new ideas! Find Andrea Howe on For The Love Of and Gwyneth Made Me Do It, and follow her on Instagram, Facebook and Twitter!